Not to be confused with SAO Bosanska Krajina. 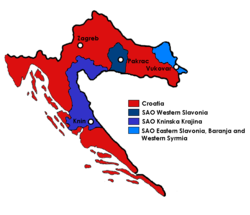 SAO Krajina (eastern purple area) within SR Croatia (red). The Serbian Autonomous Oblast of Krajina (Serbo-Croatian: Srpska autonomna oblast Krajina / Српска аутономна област Крајина) or SAO Krajina (САО Крајина) was a self-proclaimed Serbian autonomous region (oblast) within modern-day Croatia (then Yugoslavia). The territory consisted of majority-Serbian municipalities of the Republic of Croatia that declared autonomy in October 1990. It was formed as the Serbian Autonomous Oblast of Krajina (Serbo-Croatian: Srpska autonomna oblast Kninska Krajina / Српска аутономна област Книнска Крајина) or SAO Kninska Krajina (САО Книнска Крајина), but, upon inclusion of additional Serb-populated areas, changed its name simply to SAO Krajina. In 1991 the SAO Krajina declared itself the Republic of Serbian Krajina, and subsequently included the other two Serbian SAOs in Croatia, the SAO Western Slavonia and the SAO Eastern Slavonia, Baranja and Western Syrmia. After the Croatian multi-party elections in 1990, ethnic tensions within Croatia increased. The Croatian President Franjo Tuđman was planning Croatia secession from Yugoslavia, so, in anticipation, Serb leaders created an autonomous region around the city of Knin. Initially, this was dubbed the SAO Kninska Krajina, but, after joining with the Association of Municipalities of Northern Dalmatia and Lika, it was renamed SAO Krajina in December 1990. In December 1990, the SAO Kninska Krajina encompassed the Community of Municipalities of Northern Dalmatia and Lika. It merged with the Association of Autonomous Serb Municipalities and soon started making its own government institutions, including the Serbian National Council, a parliament for the region. Originally it was expected that Franjo Tuđman wanted Croatia to be a nation state within Yugoslavia after democratic and decentralizing reforms. When this turned out to be unlikely, they wanted it to be independent of Croatia but remain within the mini-Yugoslavia proposed under the Belgrade Initiative. On February 28, 1991 the SAO Krajina was officially declared. It announced that it planned to separate from Croatia if it moved for independence from Yugoslavia. The Serb National Council on March 16, 1991 declared Krajina to be independent of Croatia. On May 12, 1991 a referendum was held with over 99 percent of the vote supporting unification with Serbia. Afterwards the Krajina assembly declared that "the territory of the SAO Krajina is a constitutive part of the unified territory of the Republic of Serbia". Conflict soon began between the Krajina Serbs and Croatian authorities. After Slovenia and Croatia declared independence, violence escalated as the Serbs expanded the territory they held with the help of the Yugoslav People's Army (JNA), eventually to include SAO of Eastern Slavonia, Baranja and Western Srijem and SAO Western Slavonia. The Serb-controlled territory included a third of Croatia at this point of the Croatian War of Independence. On 19 December 1991, the two SAOs through the initiative of Milan Babić (president of SAO Krajina) and Goran Hadžić (president of SAO Eastern Slavonia, Baranja and Western Srijem) were declared as one Serbian state with the name Republic of Serbian Krajina. In February 1992, the authorities declared independence. This self-proclaimed country was dissolved after August 5, 1995 when Croatian armed forces reintegrated its territories into Croatia.